Visiting a new city can be an incredible experience. You have the chance to meet new people, stand in front of points of interest you might have only seen online, and try local cuisine. It can be just as rewarding to build in a little time for a day trip or two as well. 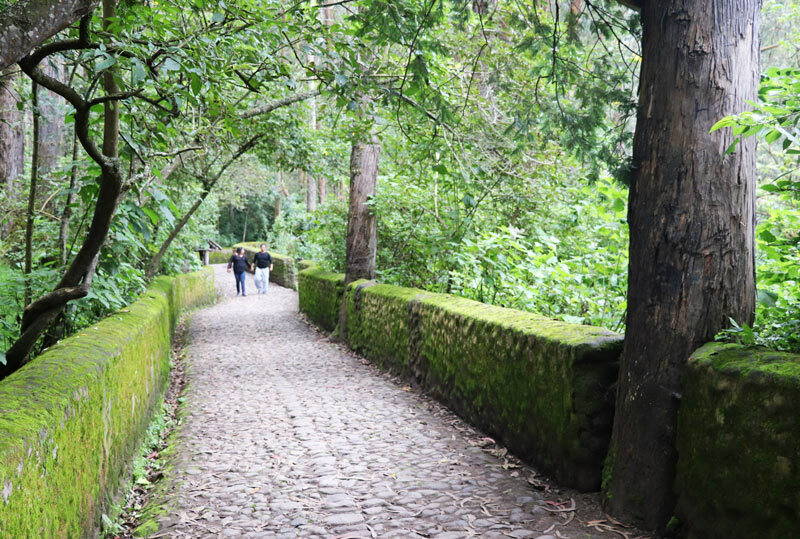 Leaving the busy streets behind to seek out a great spot for a hike or an off-the-beaten-path attraction is one of our favorite things to do, and we have been surprised by the places we have discovered on our own or through tours. Our trip to Quito, Ecuador was no exception. During our weekend visit we discovered six day trips from Quito that showed us a few different sides of the beautiful South American country. 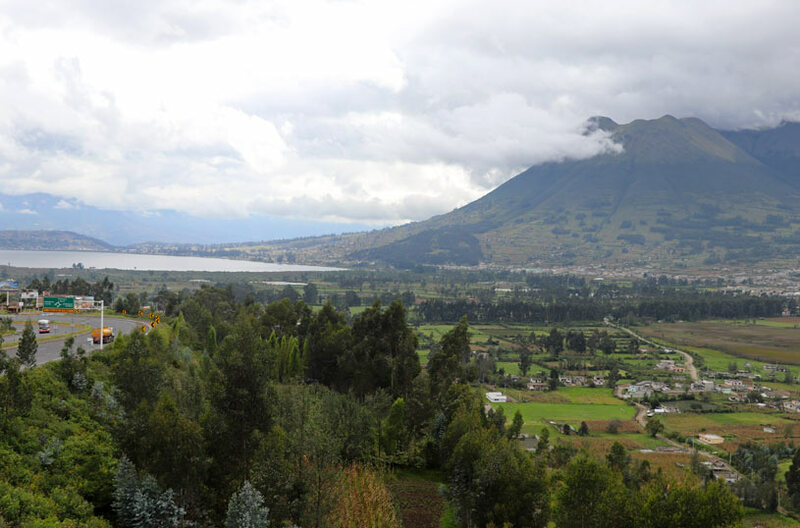 Whether you want to tackle a few of them in a single day or want to focus on just one or two that sound exciting, planning a few day trips from Quito, Ecuador will help you add some great variety and culture to your trip! Look no further than the Otavalo Market for your souvenirs! If your idea of fun day trips from Quito involves shopping, this is a destination you can’t miss. 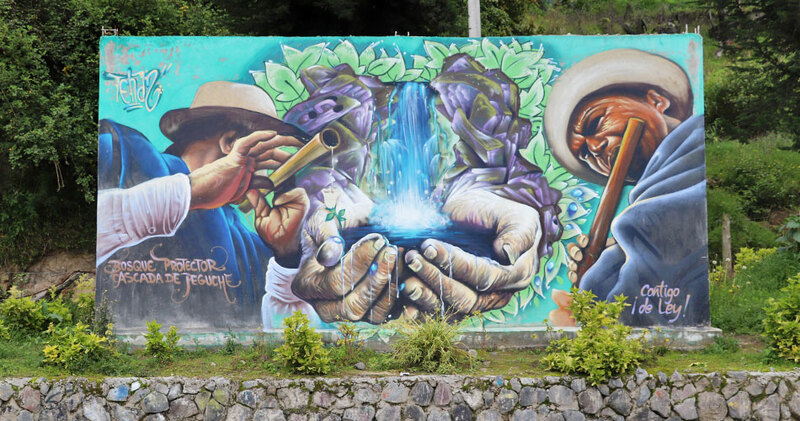 Take a two-hour drive to Otavalo, where you’ll get to experience one of the largest and most famous indigenous outdoor markets in all of South America. The market combines what might be mundane shopping for locals with exciting finds and haggling for visitors. Whatever you need, you can find it at the market. Standing in the middle of the market, we saw merchants walk by carrying everything from spices to remote controls to clothing. Our interests were a bit more pedestrian—we just needed a souvenir or two to take home with us—but it was easy to find handmade crafts, scarves, and toys that fit our needs and budget. Many vendors sold hot street food, so it’s possible to find a meal right in the market or at one of the restaurants along the neighboring streets. 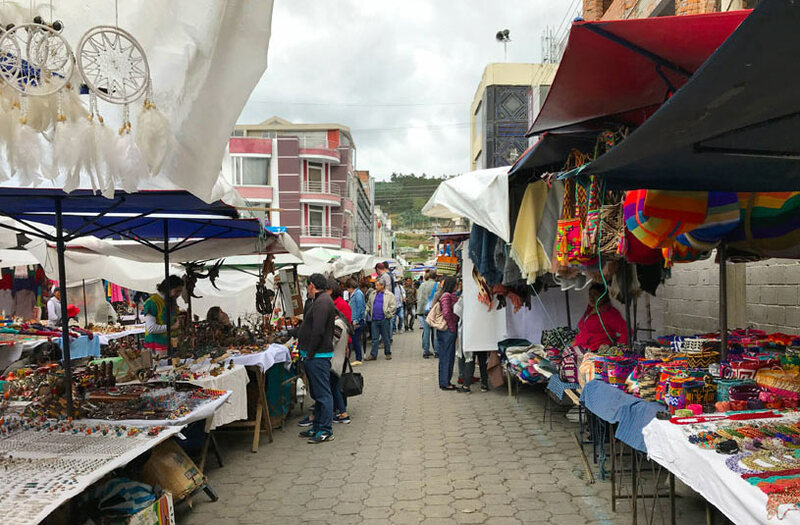 The Otavalo marketplace itself is enormous, so be sure to allocate enough time to visit based on your preferences and how much shopping or bargain-hunting you plan to do. When we arrived, our strategy was to somewhat briskly walk through the market to see what types of products were available. Many of the vendors selling tourist souvenirs seemed to have the same items for sale, so we took a close look at the souvenirs we liked the best and returned to the stalls that sold them when we were ready to make a purchase. It’s not hard to bargain for a good price (and all vendors expect it), so feel free to offer a lower price and haggle a bit before you agree on what you will pay. Although the market is big, we didn’t need more than a half hour to get our bearings and buy the items we wanted. 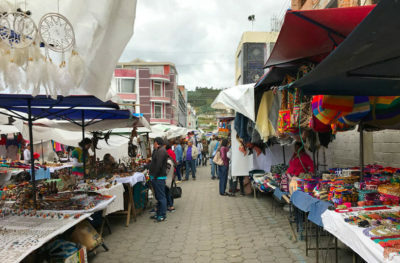 While most people will want at least twice that time, especially if you want to take photos or have a long list of items to buy, if you’re not a fan of shopping you may not need to invest a significant amount of time to the Otavalo Market. Still, don’t miss this important reflection of Ecuadorian culture. 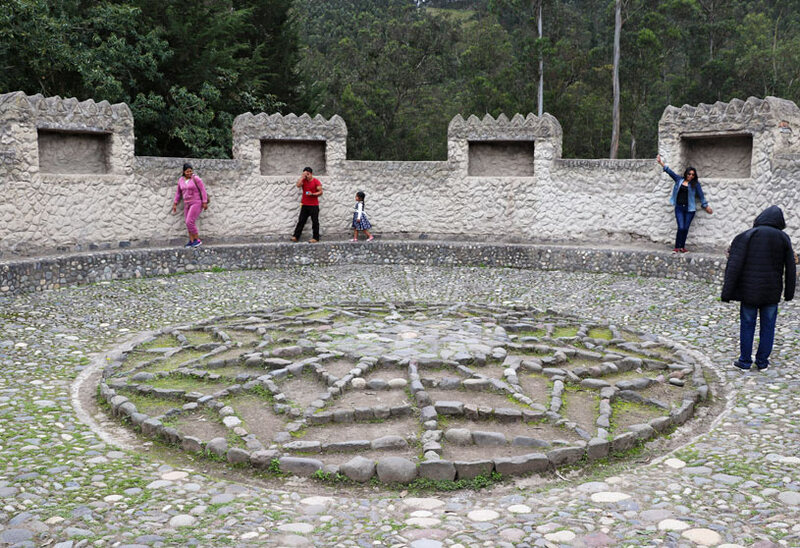 It’s one of the more fun and educational day trips from Quito that you can choose. Looking for tips on how to find the best souvenirs? We wrote about our strategy for finding the gifts that will be both memorable and authentic- take a look! Not far from Otavalo is the Cascada de Peguche, one of the more well-known tourist attractions in the area. This waterfall complex is popular for hiking and picture taking. Flowing from more than 50 feet (18 meters) above, the waterfall can be seen from a few spots. Many people line up on the wooden bridge in front of it for great pictures, and if you don’t mind getting wet it’s possible to navigate to a spot within feet of the waterfall. Several hiking trails circle the waterfall as well. 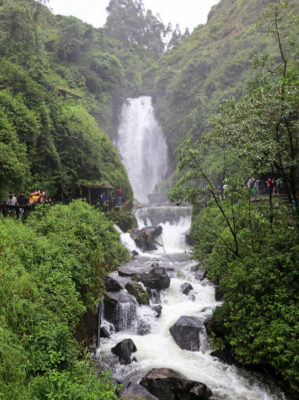 The waterfall is considered sacred to locals who conduct ritual cleansing baths each year during Inti Raymi, the festival of the sun held during the solstice in June. We didn’t feel like spending the rest of the day in wet clothing, so we thought 45 minutes was just enough time to enjoy the waterfalls (which are modest if you have visited places like Iguazu Falls, Niagara Falls, or even Multnomah Falls near Portland, Oregon). 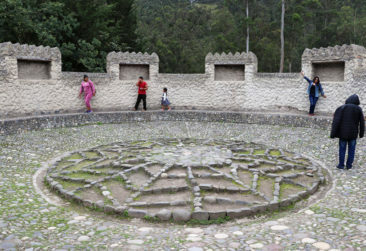 Don’t miss the ancient sundial solar calendar at the entrance to the waterfall complex, which we were excited to discover. It’s a great idea to combine the Cascada de Peguche waterfall with a visit to the Otavalo Marketplace as you are planning your day trips from Quito. If you are looking for beautiful views in a unique setting, plan a visit to the Pululahua Geobotanical Reserve. Located just one hour from Quito, you will have the opportunity to explore a volcano that erupted and collapsed around 500 BC. The word Pululahua is a Quichua word that translates to “cloud of fog,” which can pose a challenge if you are in search of the perfect Instagram shot. The weather throughout Ecuador can be temperamental, and you may need to wait a bit for the conditions to clear enough to get your photo—or see anything at all. If you time your visit just right you will be greeted to a great view of the caldera that thousands of plants, flowers, and animals call home. If you have just a few minutes to stop, you’ll find a nice viewing deck that is perfect if you want to appreciate the landscape. With a bit more time, hiking, horseback riding, and biking are great options for a half a day of adventure. 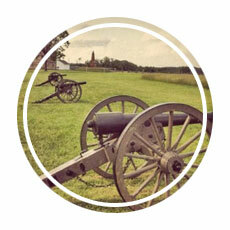 If you plan to visit, be sure to take a copy of your passport with you. You’ll be asked to provide your passport number, date of birth, and age to the staff, and while they will accept an electronic copy of your passport they will not let you in without identification. Many day trips from Quito will take you into nature, and the Pululahua Geobotanical Reserve is a great choice! 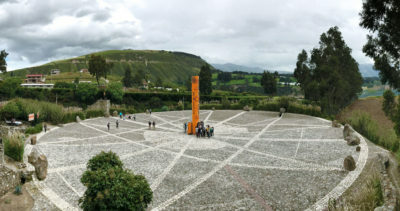 One of the most popular day trips from Quito is a visit to the equator; after all, Ecuador is named after the line that divides the earth into northern and southern hemispheres. There are several ways to experience the equator, although only one of them will take you to the exact spot where you can definitively say you stood at 0°0’0″. If you’re planning to make one of your day trips from Quito a few hours at the equator, check out our article on how to visit the equator for all of our tips and insights! It’s one of the easier day trips from Quito to plan, but the teleférico is a stop you just shouldn’t miss—it’s just 30 minutes from the city! 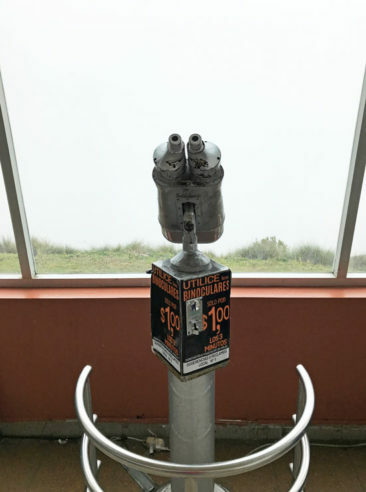 For 8.50 USD, you’ll climb from 9,000 to 13,000 feet (2,750 to 4,000 meters) above sea level during an 18-minute ride. On a clear day, you will be treated to unbeatable views of the city and the surrounding areas from atop Volcán Pichincha. 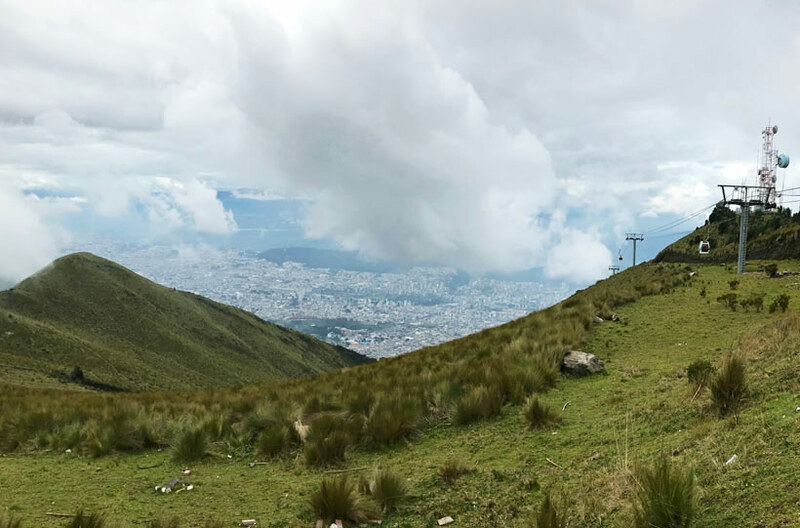 If that’s not quite high enough for you, hiking to the summit of Rucu Pichincha is a great way to see even more. The hike is challenging, especially because of the altitude, so it’s a good idea to start early in the day and take an experienced local guide with you. The view from the top of the Teleferiqo in Quito- when it’s clear. 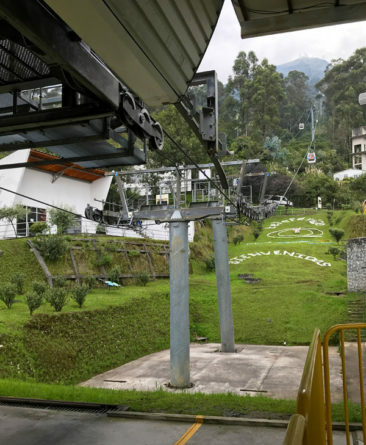 Although taking a 20-minute cable car ride, enjoying the view, and riding a cable car back to its origin might sound like one of the easiest day trips from Quito on your itinerary, there are two things to keep in mind as you plan it. The first is the weather. 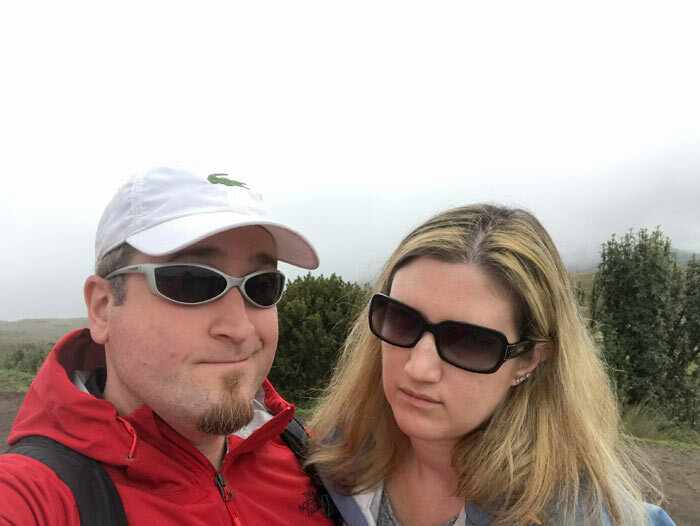 Our tour guide took us to the teleférico in the early afternoon, and when we arrived at the top we were greeted by sweeping views of… nothing. Gray and white fog swirled about, completely eclipsing the city views below. We only had about 30 minutes to explore, and although we were fortunate that the fog lifted a bit before we had to return to the city we never got the postcard-perfect shots we hoped to capture. The weather is usually best in the morning, so time your visit to the early part of your day for the best chance of clear skies. Similarly, keep some flexibility in your schedule if possible and visit when the weather is at its best. 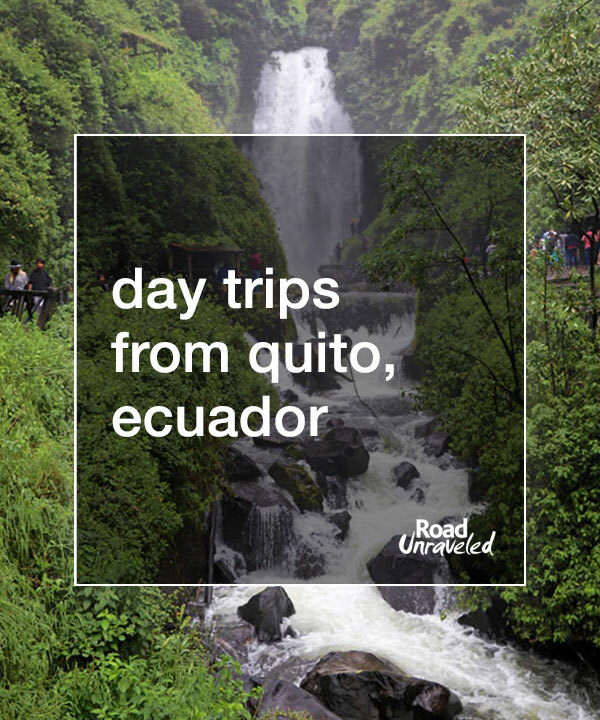 On a short trip like the one we took that might not be an option, but if you switch around your day trips from Quito based on weather conditions you might have more luck than we did! Additionally, try to visit the teleférico a day or two after arriving in Quito. Many people experience a degree of altitude sickness when they first arrive, and it can take a little bit of time to acclimate before you feel your best. The cable car ride will take you from an already challenging altitude to 13,000 feet (4,000 meters) above sea level, which is a drastic change in just 20 minutes if your body is still adjusting. Take it slowly, drink lots of water, and listen to your body. For more tips, check out our article on how to combat altitude sickness. If spending time in a peaceful village by a quiet lake sounds like a nice alternative to the busy city, San Pablo del Lago should be on your list of day trips from Quito. 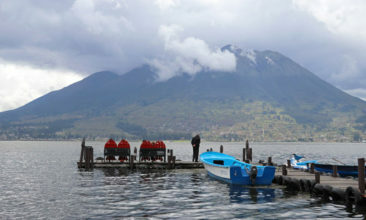 Located at the base of the massive Imbabura Volcano, the town of San Pablo del Lago is just under two hours away from Quito, and it’s a great choice for both outdoor activities and relaxing afternoons by the water. We had a chance to enjoy a 20-minute boat ride on Laguna de San Pablo, which took us on a tour of the surrounding flora and fauna from a better vantage point than our tour bus could provide. If you plan to spend more time there, paddle boats are available to rent and provide a more leisurely experience. Hiking is also popular in San Pablo del Lago, and a few nice restaurants will refuel you after a few hours of activity. If you need a little more time away than a day trip can provide, there are some great hotels that can help you extend your stay. Are you ready to book a room for your trip to Quito? Here are some hotel deals to consider. 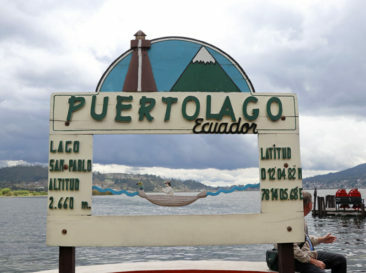 Enjoy Your Day Trips from Quito! During our long weekend in Ecuador, we only scratched the surface of the many day trips from Quito that you can experience. 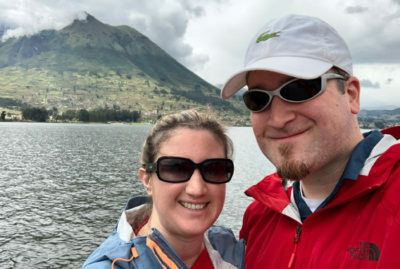 With a few more days, or a different time allocation, other popular spots like the Cotopaxi volcano and the Bellavista cloud forest might make your list as well. 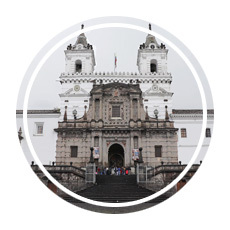 No matter what you do, enjoy the cultural and educational opportunities that come from day trips from Quito and explore the areas outside the city. Are there places outside Quito that you recommend? 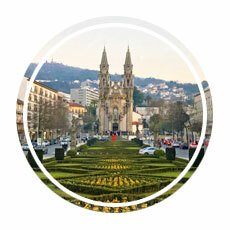 Leave a comment below and let us know which Quito day trip destinations are your favorites! 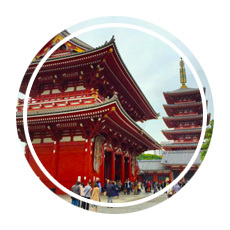 Looking for more interesting places to visit around the world? Here are a few more posts for inspiration!